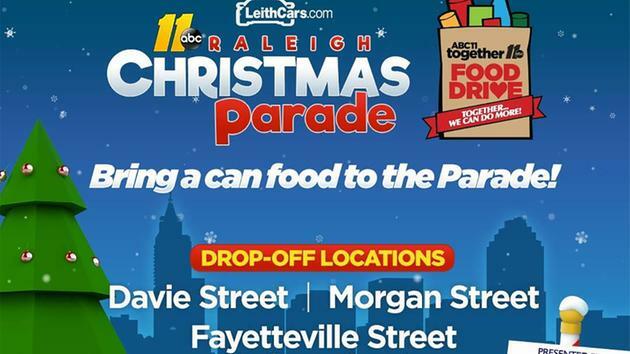 It’s almost time for the ABC11 Together Food Drive and you can bring your cans to the ABC11/LeithCars.com Raleigh Christmas Parade presented by Shop Local Raleigh. To drop off your cans, just look for the Food Drive signs along the parade route! Bring 3 cans or more and you’ll get a Zaxby’s coupon. ABC11 is celebrating more than 30 years of giving from the heart and together we can help local families fighting hunger every day. The ABC11 Together Food Drive is coming up and we are encouraging everyone to get ready for our big collection day! Click here to donate to the Food Bank of Central & Eastern North Carolina in Raleigh. Click here to donate to the Second Harvest Food Bank in Fayetteville. 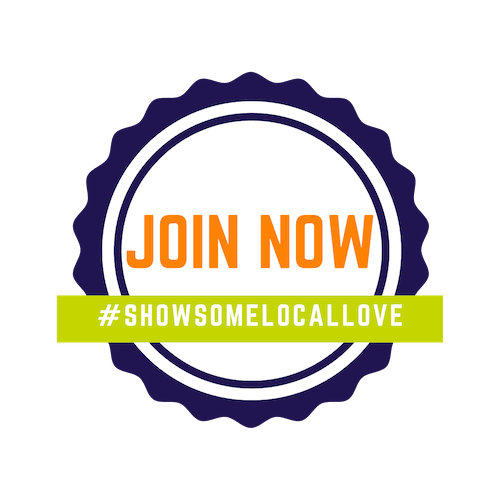 Your donation matters, food or cash, it all goes back into our community. Last year’s drive collected more than 500,000 meals for families in need and this year we are aiming for 700,000. Thank you for your support! It’s so easy to give, just look for the ABC11 food drive bins inside your local Kroger from November 17th until December 6th. Go to a location listed below between November 17th and December 6th to donate dollars or food to help feed neighbors in need. Follow ABC11 on Twitter for updates on the food drive, and share your experiences by adding the #abc11together hashtag to your tweets. 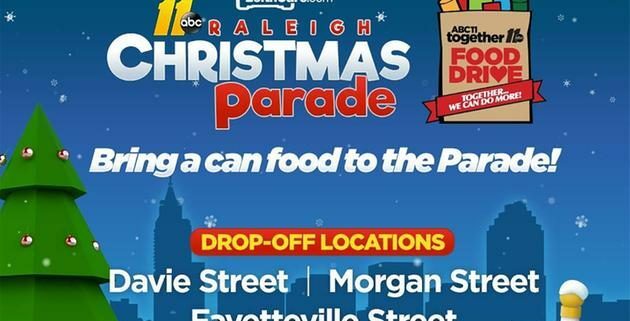 Our food drive culminates with a “drive-thru day” on December 6th, when ABC11 brings you live coverage with reporters on location at collection sites in Raleigh, Cary, Durham and Fayetteville. Companies throughout the Heart of Carolina are encouraged to organize on-site food drives to help feed their neighbors during the holiday season and beyond. 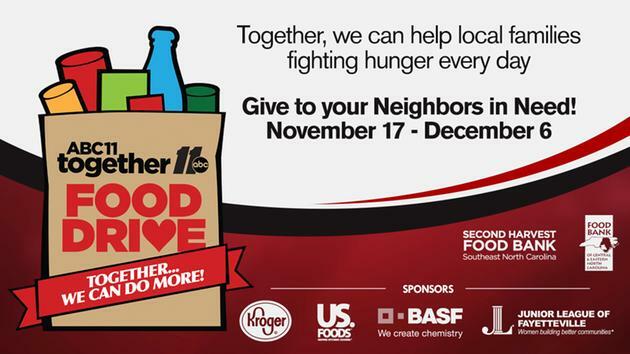 Call (919) 863-9530 to learn how to participate and then bring your food collection to a Kroger near you or the Food Bank. Thanks for your support! Durham: ABC11 studios at 411 Liberty St.